Baseball Day in Oshawa this Saturday, June 17 will feature a number of local teams in action and other activities. Last year, Mayor John Henry threw out the ceremonial first pitch. (Photo by Joel Wittnebel). It may be American’s pastime, but the epicentre of all things baseball will be in Oshawa this weekend. Babcock says Baseball Day in Oshawa has become “a staple” for the organization over the years and invited the public to come check out the festivities as well. The day will kick off with a free Super Skills Clinic, open to all players from T-Ball to bantam. “Usually we draw between 400 and 500 players,” Babcock says, adding that coaches and players from the Atom Rep team will be running the clinic. “It’s really a good way for the older players to give back,” he explained. 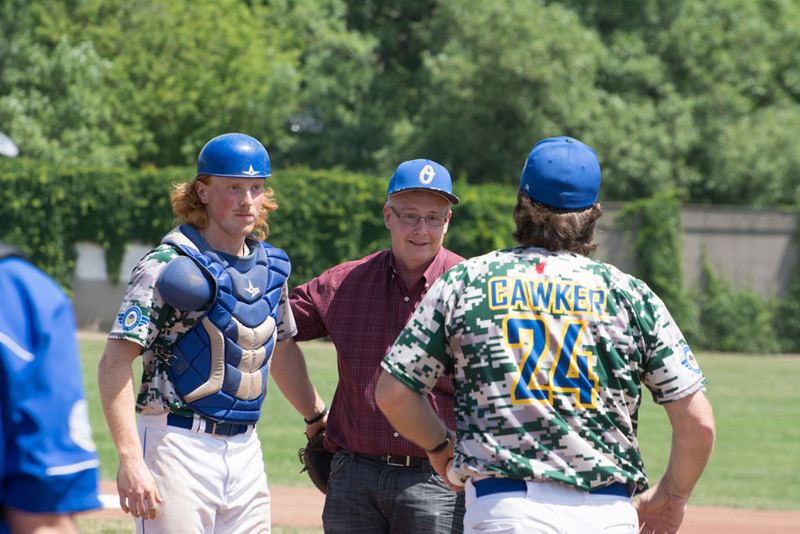 The day then continues with a showcase game between the Oshawa Jr. Legionaires and Leaside Leafs beginning at noon, with Mayor John Henry throwing out the ceremonial first pitch beforehand. “Anyone who is a baseball fan, we’d be happy to invite them to come check out the showcase game. The Junior Legionaires are one of the top teams in the province,” Babcock said. The on-field action then continues with five “mini-games” featuring a number of Oshawa teams. After the games wrap up, everyone is invited to back to Kinsmen Stadium to view the animated baseball film, Everyone’s Hero, on a 40′ screen in centre field.